Readers may have seen online a story today in which the commander of Marine Corps Recruiting Command outlined in an exclusive interview where he sees recruiting going in the next few years. Maj. Gen. Robert Milstead says things are currently going relatively well, but saw a few potential obstacles in coming years, including a declining advertising budget. There’s another element in the story that will catch the interest of the techies in the room, however. Officials at Marine Corps Recruiting Command told me that recruiters are currently experimenting with Apple’s iPad to record the information of potential recruits. It works like this: the Marines set up a booth at a public event — a county fair, maybe. The set up a contest such as a pull-up challenge, but require students interested in participating to sign a hold-harmless waiver form in case they hurt themselves competing. In the past, these forms were typically filled out by hand. Someone had to enter the contact information on them by hand into an electronic database for later. It was time-consuming, and when the hand-written information on the forms wasn’t legible, a waste of time. 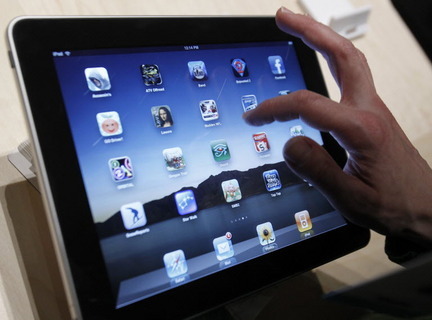 Marine officials say that by using the iPad, they can immediately capture information electronically and reduce errors. The Corps isn’t hung up on staying with the iPad, but for now, it has impressive potential, they said.